On Monday, much to the chagrin of most on the England World Cup bid committee, the BBC aired a Panorama special over allegations that certain members voting on the hosts of the 2018 and 2022 World Cup had taken bribes for their services. With the voting on this set to take place on Thursday, the BBC thought it hit a home run. However, after listening at work to the program on Five Live, I started to think most of this program was a bunch of bull. So I've decided to have a look at this program as it aired. While the program was only a half an hour in length, I've decided the only way I could give my true feelings on this show was to just hit play, watch what I could, hit pause, and just write. I honestly have no clue how this is going to look when I hit publish, so I apologize in advance. So, what are my thoughts on this Panorama 'special'? Let's take a look. 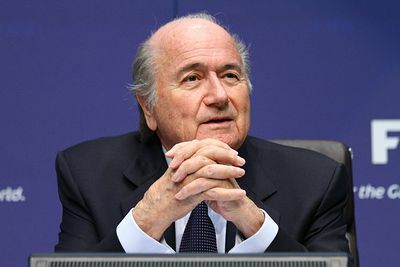 * Yes, I could understand why Sepp Blatter was not happy at the press conference aired. While the allegations were proven in video, one is never happy having to make changes to already made plans ahead of time. Now I will grant that Sepp should have treated the situation in a much different way. The answer should have been 'while I am not happy with the manner in which the investigation was done, it did lead to results. I hope we can be more careful in the future with regards to these allegations'. It would have smoothed over the wrinkles for the moment and people would have moved on in a quicker manner. Hell, it may have even prevented this program from being aired. Then again, with Jennings doing anything he can to try and nail these people dead to rights on circumstantial evidence at best, I doubt that would have happened. * So Andrew Jennings gets a hold of a 'secret document'. He never says what this document is nor where it is from. So it makes me ask the question; how on earth can the BBC do a program that is centered around a document we only know as 'secret'? Oh that's right, it takes an additional 90 second to two minutes before we find out this is from ISL. Wouldn't that information been better off told from the start? Yet the next time the document is named, it's back to 'secret'. Maybe if Jennings told us what this document was in full from the start, it would look a little more credible. * ISL.. how many times does Andrew Jennings have to go to this? Sure, ISL went to trial in Zug, it's old news. In fact, of the four named on this program, only one was ever mentioned in court. * Let's start with Senor Leoz, the man who was alleged to have taken 2 payments totally 130,000 dollars. This document shows another 3 totaling another 600,000 dollars. So all we know is money, and it was from this 'secret document'. Nothing more. So basically, you have a 'secret document' that says this man was paid three times totally 600k, and no proof they were a bribe. At this point, it's getting harder for me to take this show seriously. And Jennings, if someone was screaming at me like a mad man from a distance, I'd probably ignore him as well. * Next we move on to CAF head Issa Hayatou, who has one 'cash payment' on the list for 100,000 French Francs. So this time he gets face to face with no proof, just an allegation. Again, from my vantage point, Jennings looks like a mad man when confronting him. Did you ever think Jennings to attempt to follow a money trail from start to finish with more than just a document? Maybe call around and find out and get further proof before confronting? Yea, that's just not up your ally is it. * Next we find out about companies on the list based in Lichtenstein. One of those companies, Sicuretta, had 36 payments made to it totally almost 50 million dollars. Another of those companies, Sanud, had 21 payments totaling over 9.5 million dollars. What Jennings has is a 2001 Brazilian Senate investigation on Ricardo Texiera. So instead of Jennings trying to find someone inside Sanud to help him trace the money from Sanud to Texiera, he tries the tact he did with Leoz, failing miserably. * We then find out about the Zug ruling, and how Sepp tried to twist it. This was one thing Jennings did get right, mentioning that 'some FIFA officials were investigated and that the issue was settled out of court'. However, that's where my compliments stop. At no point does Jennings attempt to find out who these people are, how much money was paid back, and for what reason that money was paid back. If Andrew Jennings claims to be the man he is, he would have attempted to follow the trail. Instead, this just seems like shoddy reporting from a desperate man. * Now we meet David Mellor. Just from the reaction I saw from those in the UK on Twitter, they found this hilarious. I only wish I personally had the time to figure out why. * We finally end with Jack Warner. We get the rehash of his ticket touting escapades in 2006, and then his failed attempt at 2010. However, we already knew this. Thanks again Jennings for rehashing old news. One thing I wish the press would have continued to do was press Blatter for what he meant by 'official channels', instead of asking someone else. At least then, that would have been a story. * It takes 22 minutes before we finally get something the general public had no prior knowledge of: some of FIFA's government demands for hosting a World Cup. There are eight of them, ranging from Visa issues, to tax protections, and guarantees that protect their commercial interests. However, we never get a list of what those eight guarantees are. All eight should have been made known. * We end up with one final rehashing of old news, a payment of 1.5 million Swiss Francs that ended up in FIFA's accounts for Joao Havelange. The money has never been proven to be a bribe, and Jennings just goes off half cocked trying to get the answers he wants. Again, this tact is laughable at best. * The show closes with an open and honest question: is it time for people to start demanding FIFA to investigate everything? Look, everyone wants a clean FIFA. However, as much as we would like to believe everything is perfect, it's not. Hell, let's look at what England did in hopes of getting Jack Warner's vote. Does anyone forget that friendly England had in Trinidad in 2008? The reality is everyone makes deals in major business. The issue is if these deals are not made on the up and up. All everyone is asking for is full disclosure. That's not a difficult request. However, going about it in the manner in which Andrew Jennings did in this program only makes one question how serious he is about actually uncovering the truth. When this show was over, I was angry that I wasted a half hour to only get about 3 minutes of material we didn't know before. The one document this show centered around was not vetted in the manner I expect an investigative reporter to do. If Jennings wanted a story, he would have followed the money trail to it's conclusion, instead of screaming at men from a distance acting like a fool who looked past his prime. My immediate question is does one feel this will hurt Englands chances of getting the bid for the World Cup to be announced Thursday? But then something tells me this has been decided for some time. There are politics, back room deals in every walk of life, if it does not involve me or my interests, it is best to look the other way. You can only control so much, so I do not see what this show is for but a quick ratings fix.